Estimated reading time: 6 minutes, 21 seconds. 78% of chief marketing officers believe custom content is the future of marketing. Customers want personalized online experiences. Brands are giving them what they want in the form of customized content. Companies large and small are providing value to their customers: walking them through how to repair broken washing machines; teaching them how to grill better steaks; inspiring them to live healthier lives. Each and every one of these positive experiences can strengthen brands’ relationships with customers and lead to greater loyalty. The benefits of creating customized content are clear, but what about the process? Giving customers these tailored experiences requires first understanding them—their needs, desires, and pain points. Customers’ needs aren’t static, so it’s also necessary to chart them as they shift with each brand interaction and produce supportive content. Thankfully, traditional marketers have laid some of the groundwork for understanding and accommodating customers’ shifting need states. Outlined in this article are some considerations, tools, and a model for crafting customized content. People communicate emotions before they learn how to articulate them with words. At just six weeks old, babies smile at their mothers to show love. This “social smile” is a person’s first emotional action in life. It makes sense, then, that people feel first and think second. In fact, studies show that advertising campaigns with purely emotional content perform twice as well as their rational counterparts. Think about it. If you wanted to learn to play guitar to join a band, which ad would appeal more to you? One that pans from a video of someone excitedly learning the instrument to that same person ecstatically playing on stage at a rock concert; or a static image of a classroom with a marketing message proclaiming the music school to be “the best”? Effective content triggers emotional reactions. A combination of emotions and physiological and psychological needs motivate people to purchase products and services. We eat to satisfy hunger, make friends to feel that we belong, and cultivate careers to strengthen self-esteem. People generally need to fulfill biological and safety needs before they can pursue psychological ones: socializing, self-esteem, and self-actualization. 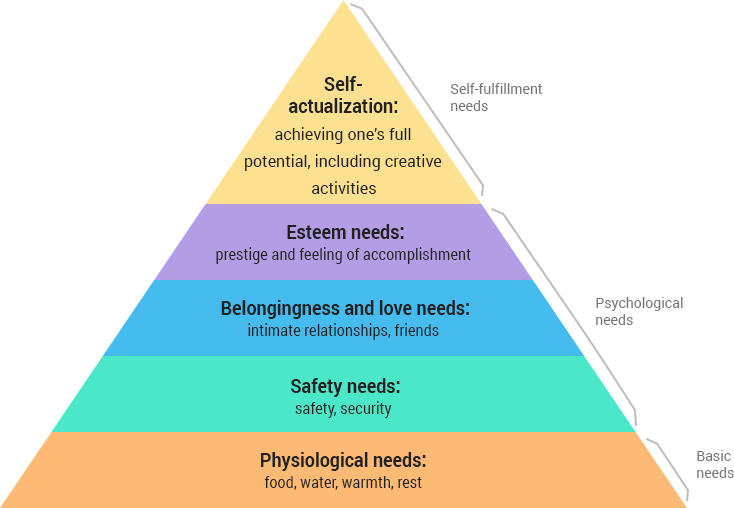 American psychologist Abraham Maslow first proposed the theory of a hierarchy of needs in the 1940s. Since then, the concept has been used extensively in marketing psychology. For example, guitar lessons would appeal to people in the self-esteem stage if you convinced them they could develop skills their peers would praise. Human motivation, however, is nuanced and cannot be completely explained by Maslow’s theory. Social, economic, cultural, demographic, and geographic factors can shape the values, attitudes, and beliefs that influence an individual’s actions. How do marketers account for all of potential customers’ needs and motivations? They use consumer data to create composite characters called personas that represent their target market(s). Marketers use personas and a model called the search cycle to map how customers’ needs change throughout their journey from becoming aware of a need to fulfilling it with a brand’s product or service. The search cycle is the series of need states a person typically has online before—and even after—becoming your customer. Below is an example of the search cycle and the types of content you would create for each phase. Marketing messages, personal observation, or other influences cause the customer to perceive a problem or need. For example, a commercial for a music school sparks a desire in the customer to learn to play guitar. Content Types: Resource pages, beginner’s guide and getting started articles. The customer conducts online searches and finds articles about the various options for learning guitar: instructional books and videos; online courses; and in-person guitar lessons. Content Types: Video, eGuides, eBooks, and whitepapers. The customer opts for in-person guitar lessons and uses local schools’ websites to compare their offerings. He or she also reads online reviews to check their reputation among the community. Sixty-one percent of customers read online reviews before converting. Content Types: Reviews, brand comparisons, and service or product literature. Emotional or logical inclinations, or both, help the customer develop a preference for one school over the others. After a visit to the physical location to meet the staff and facility, the customer signs up for lessons. Content Types: User-friendly signup webpages or simple digital shopping carts. Happy with the lessons, the customer writes positive reviews on Yelp and refers friends to the school. Studies show that customers tell three people when they’re satisfied with a product and nine when they’re not. Since cognitive dissonance in the form of post-purchase anxiety is common, businesses should provide continued customer support to confirm that the purchase was a “good” decision. 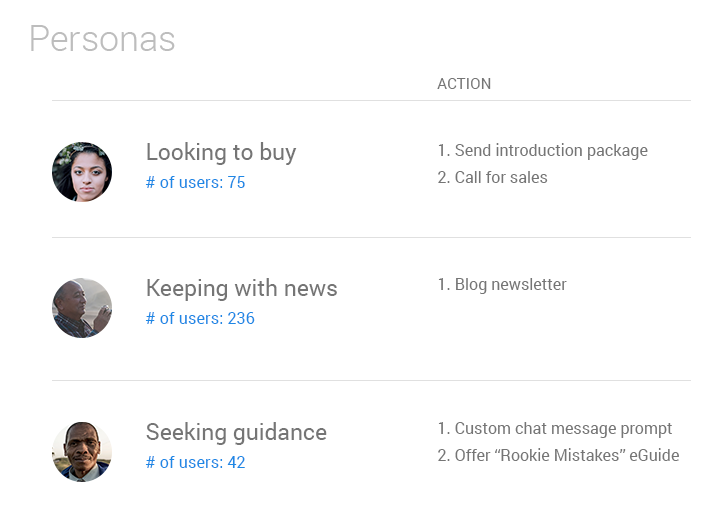 Content Types: Customer support pages and services, follow-up emails, and monthly newsletters to stay connected. Before investing the resources to develop new content for each stage, be sure to audit what you already have. Some pages may simply need to be refocused with new titles and headings, while others could take more reworking. For an in-depth guide to content auditing, check out this SlideShare by HubSpot. You know what type of information customers need along the search cycle, but how do you tailor it to your target audience? Start by creating a persona to represent that audience. Using our guitar lessons example, you might name your persona Jamming Jeff. Next explore his potential experiences and emotions during each stage, writing content that speaks to both. Experience: What actions, motivations, questions, and barriers accompany each phase of the search cycle? For example, does Jamming Jeff want to learn electric guitar so he can join a rock band? If so, the school should include testimonials from students who’ve become rock musicians after taking lessons. Is cost a barrier for him? The school could highlight its easy payment options. When you have an idea about your target audience’s specific concerns, you can address them in your content. Emotions: Emotions can serve as a powerful tool in content marketing. Our emotional brain processes sensory information in one-fifth the time that our cognitive brain does, so emotional content can quickly engage audiences. Moreover, emotions can drive desired consumer actions. For example, we’re more likely to share content that elicits feelings of happiness, amusement, and excitement on social media. Surprisingly, content that scares us can foster brand loyalty. Personalized content can help marketers connect with their target audience because it speaks to customers’ specific situations. Taking the time to understand a customer is the first step toward building a lasting relationship with them. It allows you to provide value in their lives with your content—and eventually your products or services. The audience research outlined in this article is an essential element of any successful content marketing strategy. The consumer landscape of the last couple centuries has been littered with loud, droning demands for customers’ attention, without much consideration for their needs. From the mass production of the Industrial Revolution to the broadcasting of the Advertising Age, brands’ communication with customers was pretty one-sided: marketing messages largely focused more on the product than the customer. As the authors of the The Cluetrain Manifesto presciently pointed out nearly twenty years ago, the Internet was a game changer, opening avenues of communication between brands and their customers. Conversation—the modus operandi of pre-modern marketplaces—was once again possible. Customers could ask questions, voice concerns, and even complain. Brands could use content to respond with answers, solutions, and sometimes apologies. Much has changed since the landmark insights of The Cluetrain Manifesto. The digital sphere has become crowed and cacophonous. Sparking up a conversation with your customers requires much more than a simple “Hello.” Personalization is only one tool to break through the clutter by addressing individuals by name—but then how do you keep their attention? By speaking to their needs at that specific moment. A content marketing strategy can help you accomplish this—using audience research, search tools, and content that sparks conversation, you can reach your business goals by deepening your engagement with your customers. Context is the cornerstone of conversation offline and online. Sure, you’d know better than to shout in a library, but how can you determine context from behind a computer screen? This is where the customer search cycle comes into play. The search cycle consists of the various phases a customer passes through online prior to making a purchase. Understanding your customers’ intention and specific needs at each stage of their online journey can help you capture their attention amid a clamor of marketing messages across multiple channels and devices. Thanks to smartphones and other mobile devices, customers are online all hours of the day. In fact, mobile accounts for nearly 60 percent of searches. 2 Reaching your audience requires not only crafting customized messages that speak to specific-yet-shifting needs, but also ensuring those messages find the right fingertips at the right time. 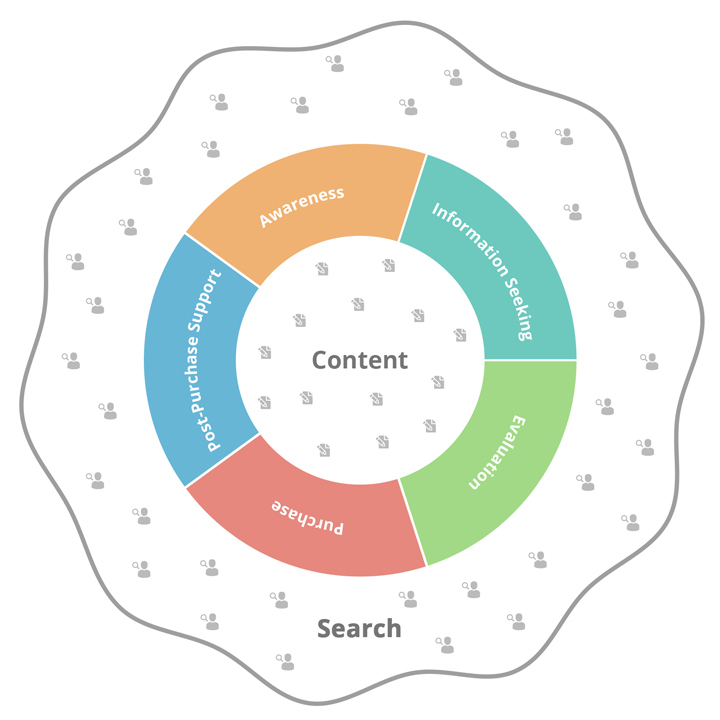 The search cycle has five stages that can occur anywhere, at any time, across any device; a content strategy aims to meet users wherever they are with content that speaks to those particular needs. Customers need different types of content at each stage of their journey to an online conversion—content that speaks to them. Consider this example: a hypothetical local appliance repair shop, Mr. Appliance, assists a family with a broken washing machine and achieves a conversion by using content to meet their needs at each stage. The washing machine for a family of six breaks down on a Sunday night. Money is a concern and they need to fix it ASAP. Through a mobile search, the father, Steve, finds Mr. Appliance’s local business and some washing machine repair videos from Mr. Appliance in search and watches some of them on YouTube. Content Type ⇾ Video/YouTube Tutorial. When a series of recommended fixes don’t work, Steve downloads the manufacturer’s manual from Mr. Appliance’s website onto his desktop. He’s trying to identify the parts and numbers on his washing machine to see if he’s capable of fixing it himself. Content Type ⇾ PDF, Manufacturer’s Manuals. Throughout the week as he tries to mend the machine, Mr. Appliance’s retargeted display ads follow him around online, displaying on Facebook and news media websites. Content Type ⇾ Display Advertisements. When his DIY attempts don’t work out, Steve decides it’s time to call in a repairman, and he already has one in mind: Mr. Appliance. He reads a few Yelp reviews to be sure he’s made the right choice. Content Type ⇾ Yelp Reviews. Using his iPhone, Steve asks Siri to pull up “Mr. Appliance,” hits the call button on the shop’s local search result, and sets an appointment for that day. Content Type ⇾ Local Business Listing. Satisfied with the prompt service and repair, Steve leaves a positive review on Mr. Appliance’s Yelp page. Content Type ⇾ Yelp Review. Steve also signs up for a monthly email newsletter from Mr. Appliance’s website about household appliance routine maintenance. Each month the newsletter offer tips to prolong the life of major appliances and also piques the interest of his inner handyman. This strengthens his brand loyalty to Mr. Appliance’s business. Content Type ⇾ Email Newsletter. As a repair business, Mr. Appliance may have been apprehensive about creating DIY content for potential customers. What if that content helped them fix their appliances and prevented them from making service calls? As counterintuitive as it seemed, offering repair assistance through content first is exactly what Mr. Appliance had to do for Steve to become a customer. Steve chose Mr. Appliance because its content communicated the right messages at each stage of his journey to conversion across devices and channels. Using valuable, useful, and comprehensive content to meet users at each stage, Mr. Appliance successfully keeps the conversation going with his target audience, building favorable brand recognition by continuously solving his customers’ problems. How can you emulate Mr. Appliance’s content marketing success? A 3-point strategy focusing on search, content, and audience can ensure you’re meeting customers at the right time with messages that resonate with them all along their consumer search cycle. A search strategy ensures you know what customers are looking for so you can tailor content to those questions and make sure they find you online. Audience research helps you learn what marketing messages are valuable and impactful to your customers based on their needs. Strategic content aligned to the search cycle allows you to spark up the conversation and keep it going—before, during and after conversion. Beyond the general rule of adhering to Google’s Webmaster Guidelines, here are some other important considerations for successful search marketing. Customers are on the go and so are their queries: more people search via mobile than desktop these days. Give them a great user experience across devices by having a mobile-friendly site built of Accelerated Mobile Pages. You can also expand your online reach by targeting content for multiple channels, such as organic search, display ads, pay-per-click ads, social media ads, and email campaigns. Wherever your customers find your content, make sure it matches their needs. Use keyword and topic research to uncover their queries and intent, and then optimize your content for both. While there are several avenues to gaining deep insights into your customers and their needs, market segmentation and personas are two tools that have proven effective over the years. Here is a basic overview of their mechanics: once you’ve gathered enough data on your target market, you can segment it into subgroups based on similar characteristics, such as demographic or behavioristic. Then you could create fictional characters called personas to represent the attitudes and pain points of these groups. Equipped with this knowledge, you can customize your marketing messages for them. Create content that meets your customers’ needs at each stage of their purchasing decision, whether that means answering questions, solving problems, or merely making them smile—just as you would if they were standing in front of you in your place of business. Adhere to a content strategy and quality standards that ensure your content is always empathetic and valuable to your customers. This means developing a content process, including clear objectives and quality assurance. The bottom line: Your content process works better when you prepare before publishing. Meeting customers’ needs with your content across their conversion journey, devices, and platforms is an essential goal of any current content marketing strategy. Whether you’re a mom-and-pop boutique just starting to blog or a mid-sized business seeking to ramp up content, understanding your audience and adapting to the shifting technological landscape helps you have the conversation that your customers want. Give your audience what they need with meaningful, strategic content so that it’s easy to stay connected to you—and not your competitors. Estimated reading time: 8 minutes, 42 seconds. Since the 1990s when the World Wide Web became a household term and millions of people began connecting in cyberspace, marketers and businesses have been constantly innovating and devising new ways to engage audiences online. Today, in a modern marketplace saturated with Facebook ads, pop-up ads, banners, and social messaging, it can feel quite crowded wherever you wander digitally, and consumers have a greater awareness and a lower tolerance for empty content and “sales schmuck” (in addition to general overwhelm). As discussed all throughout the 2016 Digital Summit LA conference held this spring, a new direction in digital marketing is unfolding: personalization. More than just a new buzzword, the idea of personalization is key to understanding a new era of Internet marketing—one that’s more focused on human connection. While unfathomably successful in democratizing information, the Internet has produced fierce competition among those who want their content to be seen (which, of course, is everyone). Today, user attention span is shorter than it was before, and consumers are savvier when it comes to navigating cyberspace. According to Cliff Seal, UX Designer at Pardot, who spoke at Digital Summit LA, users read on average only 20% of the text on any given page. He estimates that any content producer has only about 10 seconds to communicate the value proposition of the content before the user decides whether to move on. So, as Seal argues, rather than simply blasting content out into the deep recesses of cyberspace, hoping that it will accomplish a mission, make a sale, or boost rankings, instead we are entering an era in which effective content is the beginning of a human conversation. Rather than hitting the “spray and pray” button on your content marketing efforts, why not take the extra step to engage intentionally, creatively, and efficiently? Sean Shoffstall of Teradata relayed a similar message: “Marketing is a conversation. Start with hello.” If you were at a party, and someone came up to you and handed you a stack of business cards, then started spewing information about how great his company was, and asked you to buy one of his thing-a-majigs, without even asking your name, saying hello, or evaluating your interest, this probably wouldn’t convince you to buy, and it would also be a great waste of energy on his part. Needless to say, this is considerably rude party behavior. So, why would we expect anything different from our content marketing efforts? If content can be the beginning of a conversation, you probably first want to know who you’re talking to, in other words, who your audience is, and whether they are even interested in the conversation in the first place. This can be accomplished through various audience targeting methods, including market segmentation and persona building. Rather than thinking of blasting content through a megaphone to whoever will listen, we can more fruitfully craft effective content if we think about it as a two-way conversation—with a person, not a computer or a search engine. This may be a new way of thinking about content production if your content marketing strategy has been solely focused on the technical aspects of digital marketing. Well-meaning companies may take a mechanical approach, for example, churning out exactly three 600-word blog posts per week, just to hit a quantifiable mark or maintain ranking status. Perhaps these blogs are written sloppily, focused loosely on topics that don’t capture the reader’s attention, and in general, prioritize word count and keywords over quality. In other words, they’re written more to satisfy the search engines than the human searching for the content—even though, at the end of the day, it’s the humans who will be buying your products (or not). Of course, content marketing should have a goal and an aim, and should definitely incorporate how search engines operate to increase effectiveness. It’s not wrong to aim for a certain number of posts per week, or a certain number of words per post, or to engage relevant keywords (in fact, these are all good practices! ), but as Seal and others bring to our attention, powerful content marketing strategies are shifting towards prioritizing humanization. Emphasize Human Connection: In one instance, a Southwest employee went above and beyond, driving an hour out of her way to bring a vital pair of running shoes to a racer—this turned into a series of inspirational photos and blog posts highlighting this touching connection between strangers. The conversation starter here might be: when has someone saved the day for you? Feature Emotional Moments: In another instance, a little boy was perched outside the Southwest runway, excitedly waving to pilots as they took off; one pilot stopped and waved back—and then, after a proud mom posted the photo on Facebook, Southwest went the extra mile to invite the boy to meet that pilot and take a tour of the airline. Many photos, videos, and articles later, audiences tear up at the special connection sparked between a pilot and a child, remembering how childhood dreams take root. The conversation starter here might be: what did you want to be when you were little? Give Your Brand a Voice: Finally, a Southwest employee with a comedic edge, widely known for her hilarious quips and funny personality, rose to Internet fame and even appeared on Ellen. Her passengers, and then her Internet fan base, appreciated her unique spark—which inherently reflects the character of Southwest. The conversation starter here might simply be sharing a laugh. 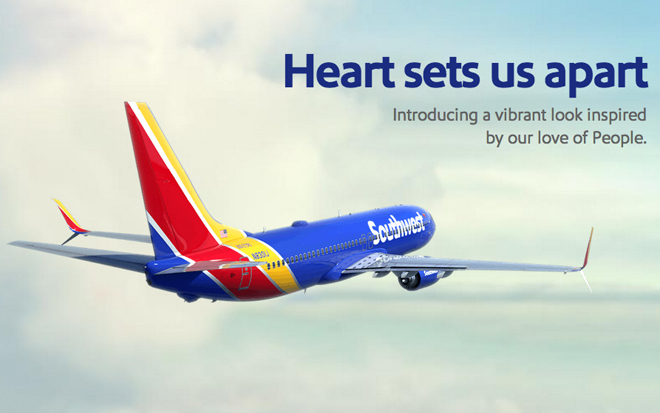 All of these examples reflect how Southwest incorporates the human element into their stories and content. There was no obvious preoccupation with how many likes, clicks, or customers the content would get, but a primary focus on telling a good story and connecting at a human level. Naturally, stories that invite a personal connection are widely shared, as all of these were. You can see countless examples of other companies catching on to the trend, too—just think about any heartwarming video of a cute animal, and the warm awwws that follow, and notice if there is a brand behind it. What if you don’t have these sorts of tearjerker moments in your specific company? That’s all right, because everyone and every company absolutely has the potential to relate on a human level—we are, after all, people behind the screens. As Shoffstall said, “Just be as close to the moment as you can.” In other words, know your audience, know your value, and connect online in a real, meaningful, emotional, value-oriented, human way. Anyone and everyone can employ the practice of remembering your reader. Prompt: What Conversations Would Your Reader Be Interested In? Think about the emotions and the motivations behind your user’s engagement with your content. In other words, what questions are they asking? Different jewelry styles and your unique approach. Imagine a conversation where you explore a reader’s particular style and aesthetic, showcasing your knowledge along the way. The high quality of the materials you use. Imagine a conversation where a sustainably minded person is interested in learning where you source your materials. Imagine talking with another artist who is curious about your craft. These could all be ways into a conversation with your reader, formulated into blog posts, videos, infographics, etc. If your reader is engaged with you, stays on your page longer, and becomes more curious about your product, then you are opening more doors for conversion by connecting on a human level. What emotion does a piece of content produce? What does your audience want, and what might be their response to the content? What is the user experience of the content? And finally: Is your content awesome? Of course, not every piece of content can do everything: engage a reader emotionally, provide information, answer a question, spark new questions, or garner a chuckle—but most likely, one piece of content can achieve one of these. It can be time-intensive to craft a piece of content well, but the time it takes is often worth it: providing clear value in your content can translate to providing clear value in your products. If you aren’t approaching your readers in this way, well, there are surely competitors out there who are. Just beginning to think about your content in the light of human connection can go a long way in providing value to your reader, which inevitably sparks a stronger connection to your brand. If you want readers to land on your page, buy your products, and share your brand, and you hope to do this by engaging them with a piece of content, it’s just good digital etiquette to offer up something of value (perhaps an exceptional story, a delicious insight, pertinent advice, or inspiring news) before expecting something in return. If your content is consistently focused first on what you are able to give to your reader in a specific conversation, then that content is more likely to engage users, build momentum, and ultimately propel your business forward. As advertisers and marketers know, it’s hard to capture the fleeting attention of consumers in the digital age. But it is possible to craft unique and interesting headlines for your personal or business use without paying an “expert” to do it for you. It just takes a little time, creativity and practice. An Internet headline is a bit like a poster for a magic show. You want enough sparkle and glam that the audience buys a ticket, enough intrigue that you don’t give away the tricks, and enough performance material (content) to back up the fireworks – hopefully the content itself delivers well-written and useful content, the equivalent of the bunny in a hat. Whatever the content is about, we encourage you to dress up the topic in your headline without being misleading in order to draw readers in. It’s a fine line, and you may not always get it right, but there are a few fundamental ways of thinking that will help you succeed more often than not. Whoever you are, wherever you are writing and publishing, take a deep breath and read on as we share some of our successes with crafting headline titles. If you are publishing an article, whitepaper or blog post, it should be because you have something to share with your readers that you think they would enjoy or be able to use. Good content takes time, thought and some research to create. Why shouldn’t it be the same for a good title? It would be a waste to publish a great piece of content with a mediocre title, and have potential readers pass it up! First, take your reader into account. Imagine your ideal reader sitting at his or her desk, surfing the Internet, looking past some headlines and diving into others. Who is this person? What interests them? What doesn’t? Step outside of your perspective and try on their shoes. Remember, you’re not targeting yourself. Therefore, start thinking like those you want to hear your message. Who is your target audience? Is it very general or very narrow? This will affect how you think about your titles. If you have a very general audience, you may want to play up the fun or cutesy angle. For example, “Why Even Monkeys Have Success With This Dating App.” If you have a very narrow audience, you may want to address them directly. For example, “Single Mothers, Don’t Fret! Our App Can Help You Find The Mature Man You’re Looking For.” You may end up with a mixture of very specifically targeted content and more general content. And tailoring a headline to your audience can help communicate value to your readers. Once you have a clear idea of whom you are targeting with your content and headline, think about how your content will benefit them. Start thinking about what sort of words, phrases and ideas will appeal to your audience. The more specific and creative you can be, the better. Always have your reader in mind. For example, let’s say your audience is prospective college students. If I am a young 20-something thinking about pursuing a degree, and I am surfing the Internet, I am probably going to be more drawn to a headline that addresses my concerns than one that doesn’t take me into consideration. I would probably be interested in a specific headline like “Thinking About Pursuing a Bachelor’s Degree? How To Pay For College Without Falling Into Endless Debt.” This pertains to me, it’s specific, it clearly communicates value, and it will be more successful than something like “Bachelor’s Degrees for Prospective College Students.” What is that article even about? It’s not clear. How can you expect a potential reader to know if it’s worth clicking on? If a reader can’t determine that the content is useful from the headline, they’re going to skip right past it, even if it’s got really great information. As they say, the devil is in the details. Vague headlines won’t capture anyone’s attention. Be specific. Let your reader know what they can expect to receive when they click on the headline. Is it the answer to a question? Is it advice? Is it expert information? Is it a laugh? Is it something they’ve never thought of before? Is it a comparison of different items? Try and anticipate these details. Then, know what tone you are going for, and try to match it with the headline. Though there are many more, let’s pretend for a minute that all content can be divided into one of two categories: Entertaining or Informational. Entertaining content usually has a headline that will inform readers that what they are getting is a fun, brief moment of no special significance. An article called “5 Terribly Cute Cats Wearing Tiny Hats” clearly indicates to the reader what they should expect. The tone of the headline is cutesy and cheesy, and it rhymes. The appeal is its cute factor. We can expect that the content will be the same – light and fun. The tone is appropriate. Informational posts focus more on providing factual or relevant information to a reader base. These can be things like how-to articles, news posts or in-depth explanations within an industry. You don’t want a too-cutesy title like the one above. Yet, you don’t want to run the risk of being boring and having a reader fly by your headline because it didn’t grab their attention. Try to give a solid indication of the information included in the content, while thinking about what would make the subject more interesting. Can you pinpoint a detail about the content that is especially visual or unique? Just like detailed specifics make for good writing, good headlines are crafted with unique or unexpected words, phrases, or ideas. There are so many articles floating around the Internet that you want yours to stand out from your competitors. Remember, we have very short attention spans when it comes to what we read online. Finally, don’t be afraid of getting a little creative, even with informational posts—but don’t go overboard. The caveat here is, sometimes it’s better to play it safe. If you have a really dry yet educational blog post about a niche subject, remember to consider your reader. For example, if you’re writing about specifics in the financial industry, your readers probably care more that you are presenting factual and useful information than a catchy title. It might take a few good brainstorming sessions to pinpoint exactly what you’re going for—but the time is worth it. Unfortunately, most of us can’t always be brilliant. Sometimes we are, and we come up with a fantastic title, and boom, we’re done. That’s great, but you can’t count on it. Rome wasn’t built in a day, and great headlines cannot be expected to just roll off the tip of the tongue all the time. If it doesn’t happen this way, rest assured that you are not alone. Usually, capturing the gist of your content in a snapshot headline is tricky. There are a lot of factors to consider: audience, tone, originality, and accuracy. Try writing a few different headlines for the same content, playing with different angles for each one. See how they feel; don’t hold back. Know that it is just brainstorming, and you’re not married to anything until you hit “publish.” This should give you the freedom to play up various angles or metaphors, that way you can see which one is the best. If you have a team of people working together, even better—two or more heads are better than one. Are Juice Cleanses All They’re Cracked Up to Be? Setting up different categories during your brainstorm can help you decide which angles best fit your purpose. Get as many out as you can, choose the best ones, and discard the rest. Or, even better, you can put the rejected titles aside as possible ideas for later, and thereby maximize your efficiency. When you hit a dry spot, take a look at titles you’ve already created. It can help spur imagination and creativity. Then, after you have a few titles brainstormed, walk away and come back to them later. Looking at them with fresh eyes can help you improve them or be clear enough to choose the best ones. If you’re really stuck, try doing a search on the Internet for similar content and see if that sparks anything in your imagination. Surf some of your favorite related blogs and let yourself be inspired. As long as you’re not ripping off an exact title, this isn’t plagiarism, but rather recognizing the value of how others have already thought about a topic. It can help you see where you can fill in the gaps in information, or continue the conversation with your own content. It’s important to create a title that will differentiate your content as well, so some competitive research is well worth it. This is the great thing about the Internet: it’s one big conversation. So don’t be afraid to dip your toes into the waters of related blogs and see what you come up with. If you are writing content, it will be unique to your perspective, and you can tailor the headline and content to fit your specific needs. Also, see what the big players are doing right. Upworthy and Buzzfeed are two Internet giants famous for their irresistible titles. And who doesn’t want to be irresistible? In today’s short-attention-span generation, it’s downright necessary to be cool and catchy. Read some of their titles and articles—what do you like and what don’t you like? What works and what doesn’t? One reason they are irresistible is because they phrase their titles in a way that targets our natural human curiosity. Check out this phrasing from Upworthy: “A Really Awesome Guy Got Tired Of Being Bullied By Trolls. So He Made This. Well Played.” The only way you’ll know what that thing is will be when you click on the headline. However, you will want to be careful to avoid sensationalism; deliver what you’ve promised to your audience. Finally, keep the process going. The more you read, share, write and brainstorm, the more interesting your titles will become, and the more fun you will likely have in coming up with your own angles on topics that you are interested in. The practice of crafting irresistible headlines is a smart blend between science and art; give it a pinch of research and a dash of imagination, and you’re on your way!